Miss Mo LoBeau and her (probably) world famous Desperado Detective Agency is back and they are determined to find out the mystery of the ghosts out at the old Inn that Miss Lana and Grandma Miss Lacy just bought. Readers who enjoyed Sheila Turnage’s last book, Three Times Lucky, will be thrilled to spend more time with the Colonel in his dinner and with Mo and all their friends. 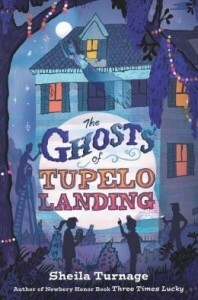 All those wonderful characters from whole town of Tupelo Landing go out to the Inn for a catered picnic, but they are unaware of the treasure buried on the grounds. Of course, there is much more than just treasure and ghosts in the story. There are blueprints, annoying classmates, blackmail and a missing moonshine still. This softly-told southern tale is perfectly told through clear dialogue and steady humor. The characters are very realistic and easy to cheer for in all of their adventures. Sheila Turnage has a wonderful command of language and a deep understanding of middle school aged kids. Her sense of adventure and daring comes through on every page. At the end of many chapters, Mo writes a letter to her unknown, “Upstream Mother,” which always proves to be enlightening as well as heart wrenching. Grade five readers will hide under the covers with a flashlight to finish study the map of Tupelo Landing on the front and back pages. They will probably read most of the night, just to stay with these great new friends. Teachers and librarians can use this entertaining read aloud to fulfill core curriculum standards and teach literacy skills through the study of rhetorical questions, and figures of speech. These are two things Mo is always trying to clarify for her confused Desperado partner, Dale. Read this book for the pure enjoyment it provides and then keep an eye on it. This book is going to be up for a lot of awards in the years ahead.